Bobcat® automatic grading solutions deliver more accurate grading results with less time and less labor. 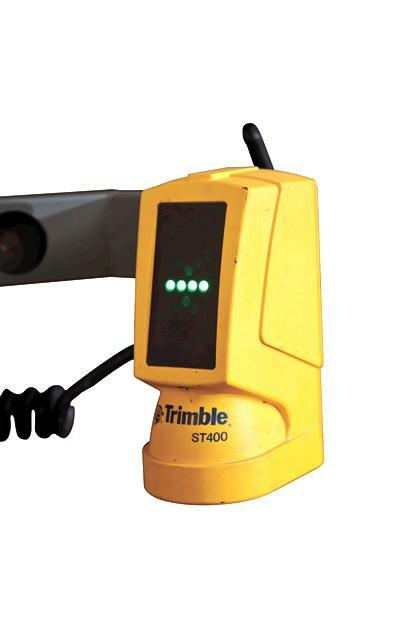 Choose from laser-guided systems and sonic/slope systems. Operators will increase their efficiency and reduce fatigue since they can focus on operating the machine’s travel, rather than the blade position. Fewer people are also needed because, with near-perfect accuracy, there is no need for a crew to continually check grade on the jobsite. It’s as simple as clicking a button on the loader controls to activate the automatic system. With accuracies better than +/- ¼”, automatic grade control systems can also save on expensive finishes such as concrete. A sonic tracer and cross-slope system is available for use with Bobcat’s larger grader attachments. Whereas the laser-guided systems require a laser transmitter and can only follow a plane of light, the sonic/slope system will follow the terrain below the sonic tracer (mounted on one side) and maintain a consistent cross-slope that has been predetermined. This system also works well on jobsites in which the transmitter may not have complete visibility to the receivers at all times. Two auxiliary components, including a rotation sensor and mainfall sensor, provide correcting information to the slope sensor when traveling up or down hills or when the blade is angled. Mounted on either side of the moldboard, the sonic tracer uses ultra sonic signals to maintain a distance between it and an object below such as a stringline, previous pass, or curb and cutter. The sonic tracer only moves the elevation cylinder for the side of the blade on which it is mounted. This sensor moves the opposite side of the blade to maintain a set cross slope that was entered by the operator. The cross-slope sensor only moves the elevation cylinder on the opposite side of the sonic tracer. The panel allows the operator to set the parameters of the grading system while providing real-time information such as distance-to-target for both elevation and slope. The panel saves money and valuable cab space. The operator places the sonic tracer over the top of the object he wishes to use as a reference and sets the blade depth as needed. For example: An operator prepares the sub grade for a road in which the curb and gutter has already been poured. The operator sets the sonic tracer above the gutter and sets the cutting edge of the moldboard 6 in. below that point. The operator then “zeros” the sonic tracer using the Deluxe Instrumentation Panel. Since roads are typically crowned, the operator enters a 1% slope using the Deluxe Instrumentation Panel. After clicking a button on the loader control handles, the system is in automatic mode and the operator starts driving the machine. The blade maintains a depth of 6 in. below the curb at a 1% slope going up toward the center of the road. The system is also capable of operating only the cross-slope in automatic mode. 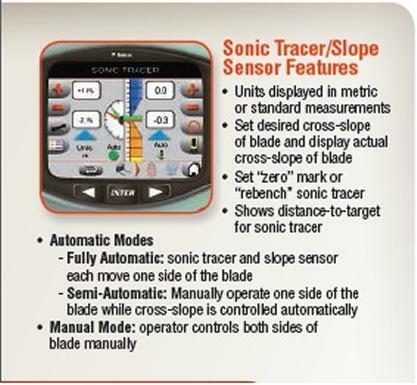 The operator disables the sonic tracer and manually controls the side of the blade on which the sonic tracer is mounted, while the cross-slope sensor automatically maintains the correct cross-slope across the blade. This is especially useful when making first passes to provide a smooth surface for the sonic tracer to follow on the next pass. Automatic Control: Requires less operator input while providing better accuracy, reduced operator fatigue and faster travel speeds. Fingertip Controls: Mounted on the carrier’s steering levers, fingertip controls provide quick and easy access to make elevation changes or switch the automatic function on or off, delivering precise and accurate results with maximum operator comfort. Manual Override Function: While in automatic mode, if the operator pushes a switch to move the blade up or down, automatic mode is momentarily interrupted. When the operator releases the switch the system immediately returns to automatic mode.